Donations from individuals are welcome as support for the Druid Hills Patrol annual operational expenses. Donor names will be listed on the website Donor and Sponsor page as well as mentioned on the DHP Facebook page. If you so choose, you may remain anonymous. 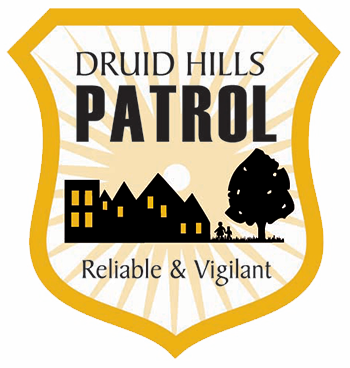 We invite businesses to become Druid Hills Patrol annual sponsors and enjoy a listing on the DHP Donor and Sponsor webpage. Gold and Platinum sponsors may also have their logos featured on this page. Sponsors will receive additional acknowledgment on the DHP Facebook page. *Gold and Platinum sponsors who want their logo displayed on the sponsor page should contact us at [email protected] to learn about technical specifications for logo artwork. NOTE: We are a 501(c)(4) organization. This means that we are a nonprofit, but sponsorships and donations are not tax-deductible. However, all contributions help to increase the safety of our neighborhood.